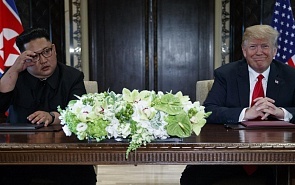 After a string of high-profile summits that culminated in the Kim-Trump meeting in Singapore on June 12, there has been a lull on the North Korean diplomatic front. Judging by all appearances, the parties maintain confidential working contacts but their results are unknown. Trump’s numerous open and hidden detractors at home point to the lack of serious North Korean movement toward denuclearization as proof that the White House’s policy of détente with North Korea is a fiasco. The US press regularly publishes leaks from the intelligence community claiming that the DPRK, far from disarming, continues to build up its nuclear arsenal at a rapid pace. Doubts have even been raised about the authenticity of the remains of American soldiers that Pyongyang has returned to the US as a goodwill gesture. But it is hard for Trump’s opponents to deny that the situation on the Korean Peninsula is much more peaceful than it was just a few months ago and that the threat of a major war has receded. The question is how protracted the lull will be and whether it will be transformed into a durable peace? The evidence is contradictory. Despite Pyongyang’s appeals to adopt a declaration proclaiming the end of the Korean War, Washington is still procrastinating. Likewise, the Americans are not ready to agree even to a partial relaxation of sanctions. All concessions that the sides have made to date – the North Korean moratorium on missile and nuclear tests and the US suspension of large-scale military exercises on the Korean Peninsula – can be reversed at any moment. But we can claim with a high degree of certainty that the trend toward normalizing North Korean-US relations will continue for at least the next few months. I would even hazard that Pyongyang is not interested in undermining Trump’s political position in the run-up to the critically important November midterm elections to Congress. The DPRK will therefore refrain from any steps, such as a resumption of testing, which Trump’s political enemies at home could use against him. More likely than not, Kim Jong Un will even make new concessions that Trump can tout as achievements of his personal style of diplomacy. These understandings can be announced during the second US-North Korean summit which, to believe some signs, is being scheduled for late September on the sidelines of the annual UN meeting in New York. Given that the sensational summit of the two extravagant leaders in Singapore boosted Trump’s approval ratings at home, the White House is certainly hoping for an electoral bump from the next summit since the midterm elections will be just round the corner then. It is still too early to judge whether Donald Trump, Kim Jong-un and Moon Jae-in deserve the Nobel Prize, of which one of these politicians is clearly dreaming. But all the same we owe these three for the coinage of a new word, “diplotainment,” to describe a new phenomenon in international relations, where diplomacy is mixed with modern media and the natural theatrics of politicians to become something indistinguishable from a reality show. I would go ever farther and surmise that for Pyongyang, Trump represents a historic chance to achieve normalization with the US while retaining nuclear weapons, something that would have been impossible under more conventional presidents. This is why Kim Jong Un may be interested in helping the current White House inhabitant win both the midterms and another term of office. What arguments are there to support this assumption? First, Trump and Kim have clearly established a rapport. It is hard to say how likable Kim finds Trump, but it can scarcely be doubted that Trump has taken a liking to the North Korean ruler. Second, Trump is indifferent to liberalism and human rights and is inclined towards an absolutist interpretation of sovereignty, which allows governments to do as they please within their national borders. This is precisely the concept of sovereignty that North Korea abides by. Third, it is no secret that Trump is skeptical of the system of US alliances and the stationing of US troops on the territory of overseas allies, which makes the idea of compromises over the US presence in South Korea more realistic. Finally – and perhaps most importantly in this case – denuclearization is not a sacred cow for Trump. Despite the rhetoric about “complete denuclearization” of the DPRK, it is possible that the Trump administration will eventually agree to a deal that will de facto let North Korea keeps its nuclear status, while allowing Washington to declare that the North Korean nuclear problem has been solved. Under a deal, North Korea may have to verifiably dismantle a considerable share of its nuclear arsenal and production infrastructure, primarily those components of the North Korean nuclear missile complex that present a direct threat to the US territory, such as intercontinental and intermediate-range missiles. As an insurance policy, North Korea would retain a minimal amount of warheads, fissile materials and production capacity, but would not flaunt them, at least in communications intended for foreign audiences. According to prominent US expert Jeffrey Lewis, the deal may come to resemble the current nuclear status of Israel, which does not acknowledge the open secret of its nuclear weapons, allowing the Americans to pretend there is no problem. On April 1st , 2018, joint exercises of the armed forces of the Republic of Korea and the United States were launched on the Korean peninsula. Foal Eagle field exercises, combined with the Key Resolve command-staff games and computer simulations are considered one of the largest in the world. This year, the Foal Eagle drills include 11.5 thousand American and 290 thousand South Korean troops. There is also a more exotic option: North Korea may ultimately subscribe to a commitment to complete denuclearization, but the Trump administration will consciously refrain from insisting on total verification, tacitly acquiescing to the possibility that the North could hide a certain amount of warheads, materials and nuclear infrastructure. Of course, it won’t be easy to thrash out even such a “limited” agreement on North Korea’s not quite complete denuclearization. But there is still time for talks. As a result, Pyongyang and Washington may announce, sometime in late 2019, that they have reached a historic agreement and start implementation in 2020 just in time for the next presidential campaign in the US, with Pyongyang at least not creating unnecessary problems that Trump’s political enemies at home could exploit. Both Kim and Trump are invested in one another. The Trump presidency, especially if it extends beyond 2020, gives Kim an opportunity to turn relations with the world’s only superpower from hostile to normal and even to become a US partner, emerge from international isolation and, what is of no small importance, avoid vassal dependence on the Chinese Big Brother. For Trump, a successful deal with the DPRK will be part of his presidential legacy and his main foreign policy achievement that boosts his chances of reelection. The leaders’ interdependence makes them natural allies and increases the likelihood that one of the most difficult international security problems will ultimately be solved.